About 6 months ago I posted three jigs from the 1798 manuscript of North Yorkshire miller Joshua Jackson. Here’s another one, which I missed at the time, but which is a rather nice simple jig. This is one of those tunes that have languished in a manuscript book, largely unplayed, and for which I’ve never got round to thinking up a proper name. Jim Adams was a work colleague at Thames Valley University. Among other things, he used to produce video tutorials, and suggested that I might like to provide some intro/outro music. This was the result. I’m not sure it was entirely suitable, and in any case it never made it into any format which Jim could use. But occasionally I’ve gone back to it. And I have to say, it’s not a bad tune. Besides, who doesn’t like a nice bit of 5/4? It occurs to me that there’s a recently invented tradition of Cornish dances in 5-time – Kabm Pymps. I’m not sure if this meets the criteria for this type of dance tune. But if so, Cornish chums, help yourself. You might even like to give the tune a proper title. In 1986 Chris Wood got a call from Martin Carthy, inviting him to join Sue Harris, Chris Taylor and Martin himself as one of the musicians for the RSC’s production of Nigel Williams’ play Country Dancing. I saw the play towards the end of its run at the Barbican but, even before that, the two Chris’s had introduced me to some of the tunes being used. The one that stuck in my head was ‘Candle Dance’, written by Sue Harris. Now, I say it stuck in my head. I’ve just compared the way I play it, with how the tune is written out in the John Kirkpatrick and Sue Harris tune book ‘Opus Pocus’, and it’s really quite different. I don’t know if I’ve misremembered it or – and I think this is more likely – I didn’t learn it quite right in the first place. Oh well. Isn’t the oral tradition wonderful? 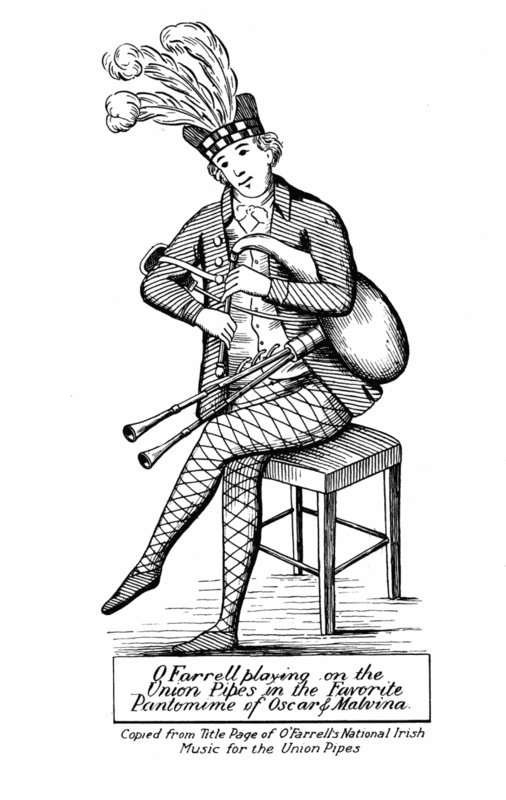 An image of O’Farrell reproduced from the title page of his ‘National Music for the Union Pipes’. From ‘Irish Minstrels and Musicians’ (1913), by Capt. Francis O’Neill, via Bill Haneman’s website. Being a grand selection of favourite tunes both Scotch and Irish, adapted for the pipes, flute, flageolet and violin : Some of which was never before published : With some favourite duets for the above instruments. Almost nothing is known about O’Farrell (not even his first name), but he published the first tutor for the Irish pipes, and is known to have performed professionally on the London stage. One of the productions in which he played was ‘Oscar and Malvina’. In pursuing the connections between this “ballet-pantomime” and the tune ‘Kempshott Hunt’ I looked through a photocopy of the ‘Pocket Companion’ at the Vaughan William Memorial Library – and copied out a number of other tunes. Several of which, like this one, don’t sound remotely Irish (OK, maybe it’s the way I play it). These days you can find copies of the collection in various places, including the Internet Archive. Quickstep from O’Farrell’s Pocket Companion. Digitised by the National Library of Scotland, via the Internet Archive. Believe it or not, Magpie Lane was not always the slick, well-oiled machine you see these days. When my children were young I was almost invariably late for rehearsals, and at various times over the years other band members have been guilty of a degree of tardiness. The title for this tune arose from a comment made by Mat Green at a particularly inauspicious Sunday afternoon practice. Unusually, I’d arrived at his house on time. The rest of the band turned up about half an hour later, with the exception of one person – who shall remain nameless – who, it transpired, was at a birthday party in Birmingham and never showed up at all. Mat – who is simply never late – was particularly miffed, as he’d given up a day’s overtime, tending to the health of the county’s water courses. Still, as he looked out of the window on a particularly cold, wet and windy Sunday afternoon (not dissimilar to the weather we’ve seen the last couple of days), being inside in the warm was “better than winching sluice gates in the rain”. I can’t recall if I already had this tune knocking around, looking for a suitable title, or if the title came first and the tune later, but it was a phrase that stuck with me. The abc notation below is a transcription of what I actually wrote down in 2001. What I actually play seems to have departed from the original in a few places. You can take your pick. This tune was named in memory of my grandparents, Albert Victor and Madeline Florence Elkins, better known as Bert and Madge. 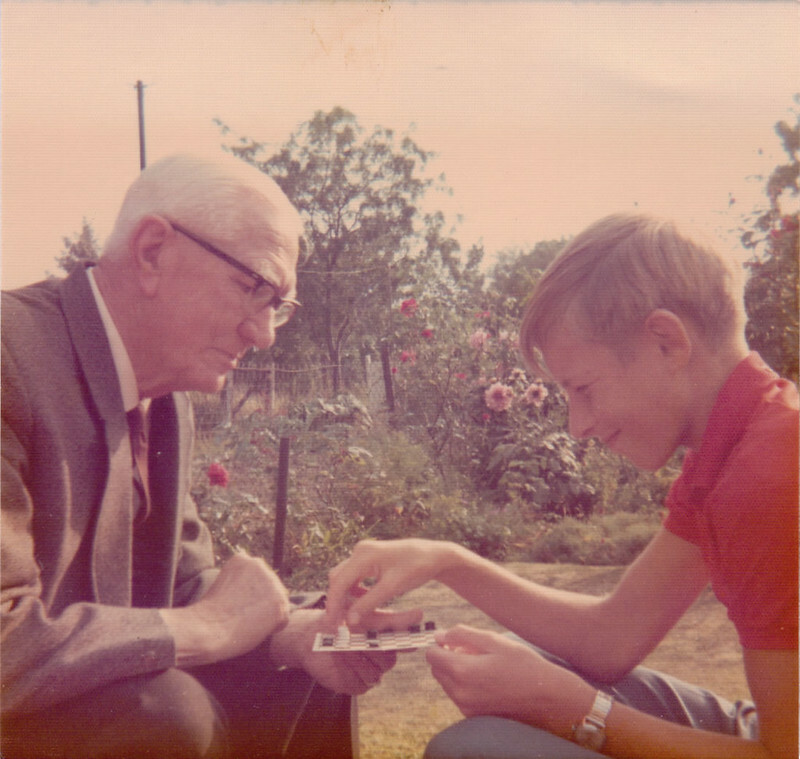 When he left school (at the age of 14, I imagine) my Grandad started work as an errand boy for the local Co-operative Society. And apart from four years in the army during World War I, he stayed with the Co-op for the rest of his working life. 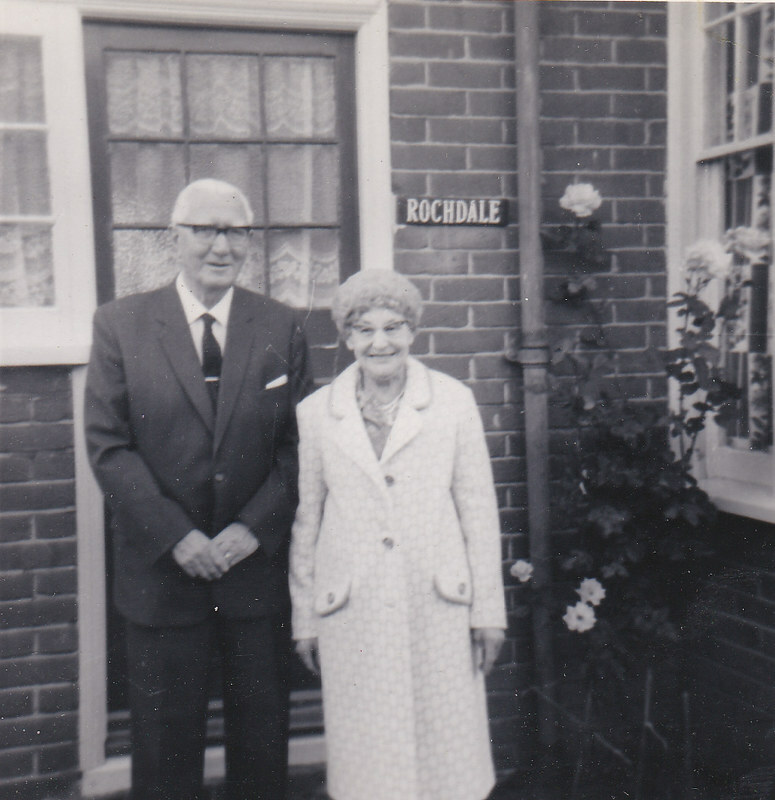 Married in 1923, he and my Grandma lived in a series of houses owned by the Co-op: first at Sellindge, where my Grandma had to go to a well at the bottom of the garden to get water; then in Hunter Road, Willesborough; and finally, from about 1938, at ‘Rochdale’, Victoria Crescent, Ashford. I spent many happy hours at ‘Rochdale’, being fed sweets and cakes, playing draughts with my Grandad and, on my regular Friday after-school visits, watching Crackerjack (Crackerjack!). 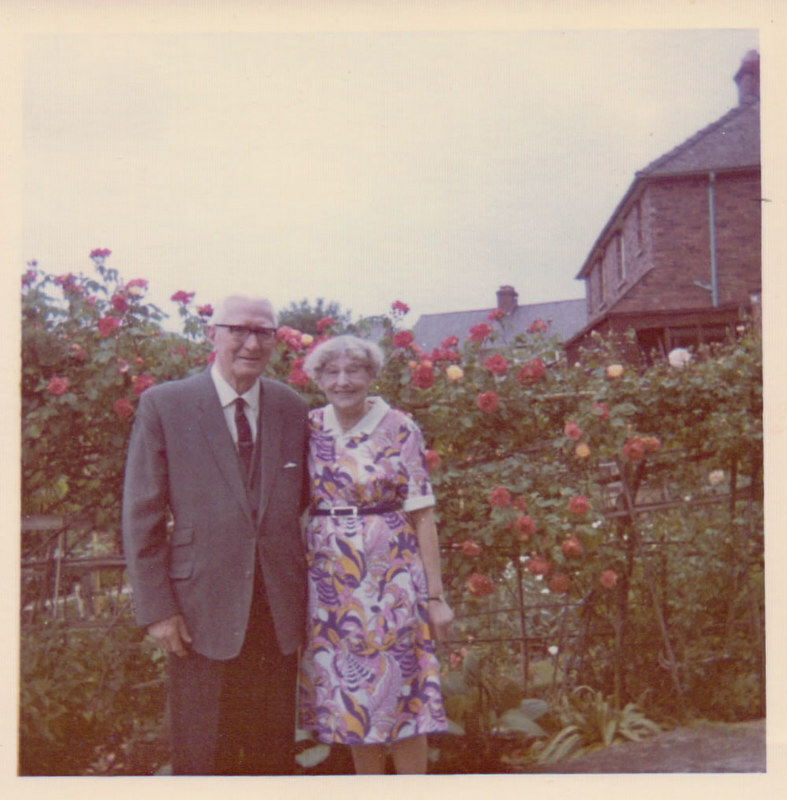 My Grandad died in January 1985, after almost 62 years of marriage. Grandma continued to live at ‘Rochdale’ until October 1987, when a large part of the house’s roof was blown off during the great storm of ’87, and she was forced to move out. She died a few months later. Bert and Madge Elkins outside their house, probably 1970s. 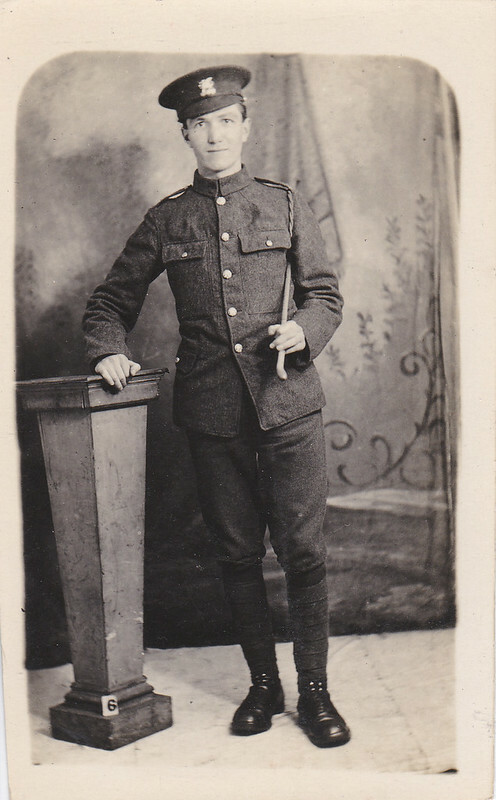 Bert Elkins in his Buffs (East Kent regiment) uniform. Probably 1914 – a portrait taken just after joining up? The uniform certainly looks new. This was composed by Chris Leslie, and is used by Adderbury Morris for a stick dance. The tune takes its name from a phantom coach and four belonging to eighteenth century villain Sir George Cobb, which is alleged to haunt the village green, the horses breathing fire. Chris recorded it as part of the Adderbury Medley on the first Magpie Lane CD. In the early days of the band, when Chris regularly performed with us, we’d all join in on this set when he reprised ‘Stourton Wake’, but I never had occasion to learn this tune. Recently, however, the tune has been surfacing in my consciousness with increasing frequency, and I’ve taken a real shine to it – in fact I think it’s a bit of a gem, which deserves to be more widely played (and not just for the morris – it would work well as a country dance tune too). falling accidentally, 29th March, 1762, into a moat, at the seat of John Blagrave, esq. near Reading, was drowned, at the advanced age of ninety, when the BARONETCY became EXTINCT.